In 1990, the New Castle County Council created an ethics code and an Ethics Commission. 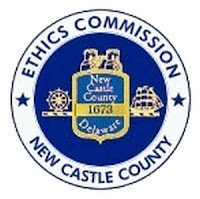 The ethics code prohibits conflicts of interest and appearance of impropriety in the conduct of New Castle County public officials and employees. It is in their mission to investigate and discipline if there is evidence, or even the appearance of a conflict of interest (COI). STOP clearly applies. A conflict of interest exists if the circumstances are reasonably believed to create a risk that a decision may be unduly influenced by other, secondary interests, and not on whether a particular individual is actually influenced by a secondary interest. A widely used definition is: "A conflict of interest is a set of circumstances that creates a risk that professional judgement or actions regarding a primary interest will be unduly influenced by a secondary interest" (Wikipedia). "... I have learned through my preliminary inquiry that Setting was in a position where he would profit equally whether a developer purchased the property or whether a government purchased the property. This mitigates against your allegation that Meyer would be influenced by Setting to make sure the land was purchased by a developer. Setting did not care to whom the land was sold". 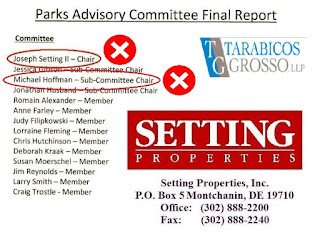 Yet, according to a Wilmington News Journal article in July 2015, Mr Setting is/was indeed the developer, along with Greg Lingo. As developers, they invest in and pave over land, expecting an exponential return with the sale of homes. Hardly something not to be interested in. "Developer Joe Setting, of Montchanin-based Setting Properties Inc. is partnering with developer Greg Lingo, formerly of Cornell Homes, and the Felician Sisters on the project"
We responded that we would forfeit our case if -- IF -- the NCCEC can provide the proof concerning Mr Setting's role in the property, and that he was not the developer at the time Meyer appointed him to Chair the Parks Team. Our understanding is quite to the contrary, that Mr Setting was in a position to benefit financially as developer, but may have changed to a different role when the COI became apparent. We also asked repeatedly if it was possible for the NCCEC to produce the membership in each of Mr Setting's LLCs, and what exactly their role was in all of this. This is not something that a FOIA (Freedom of Information Act) can accomplish; these are privately held corporations that owe nothing to public relations. That question goes unanswered. 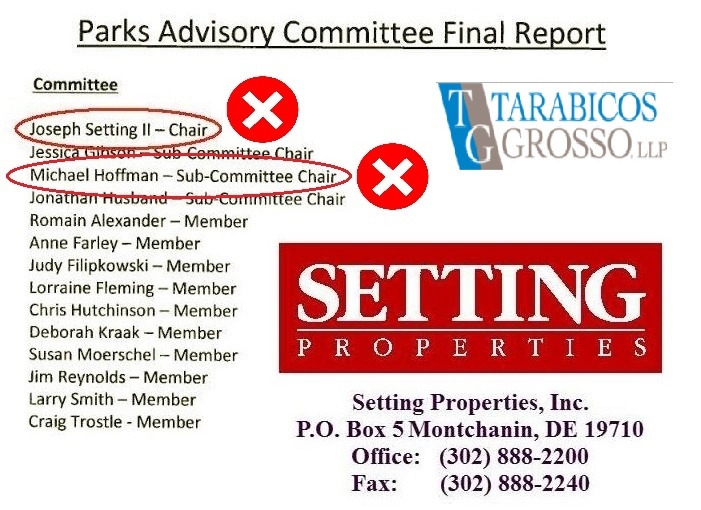 If we can achieve creditable proof to the contrary, that indeed Mr Setting was a "neutral" party in terms of who the Orphanage Property was sold to when he first took the Chair of the Parks Team, we'll consider the case closed. Otherwise, placing the developer on the "Team" that sets regional park priority for the very region that he's going to profit from (by developing its last suitable parcel for such a purpose) IS a conflict of interest. It also has all the appearance of impropriety on the part of Meyer, which is also forbidden according to the Ethics Code and subject to a probe by the NCCEC. With such a vested interest in development of the Orphanage Property, placing it at #3 would make perfect sense for Setting/Hoffman; any funds left over in the NCC budget will be depleted on #1 and #2 -- south of the C&D Canal and in Red Lion -- well before Ogletown-S. Newark came around. It should also be noted that NCC already owns the parcel(s) needed south of the Canal, and Red Lion was donated by a philanthropist. On the other hand, #3 (STOP) was a one time ever opportunity, with the Felician Sisters looking to cash in at the appraised value. And, with a joint purchase including the State, NCC was getting a bargain at half price. It should have easily been #1. We made sure to CC Senator Bryan Townsend, to draw his opinion on Exec Meyer's/NCC's sincerity in executing a buyout agreement, and whether a FOIA would produce the "proof" of collusion that the NCCEC is asking for. As an attorney himself, and Senator for the effected district, his office can and should be pursuing the truth concerning any unethical and illegal actions that could harm his constituents, especially in such an extreme manner as STOP. Instead, it is STOP advocates that are tasked with the impossible; providing the proof that Meyer wasn't sincere and/or staged his failed actions toward a buyout in order to seal the deal for development. We'll provide coverage on this and Townsend's reaction (or lack thereof) in our next article. We disagree with the NCCEC on their protocol, and must question their usefulness. Their purpose should be to first determine if there's a COI based on the legal definition of the term, above. STOP clearly fits. Then they should launch a probe which includes witness testimony and evidence gathering in all its forms. It shouldn't be up to the layman to prove to one Govt agency that malfeasance occurred within another Govt agency, in this case, the one that also happened to appoint those serving on the NCCEC. This is completely irregular, and if that's how they operate, it is a setup for failure and suspicion of collusion.